Lance shaped green leaves with deep red veins. Lemon flavored leaves that can be added to fresh summer salad and soups. Perennial. H:45cm W:34cm. 12cm, 17cm. A large green, spinach-like leaf with a sour citrus flavour. 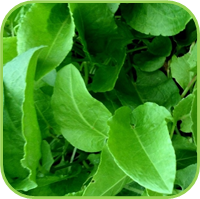 The French Sorrel is a great addition to soup and stews. 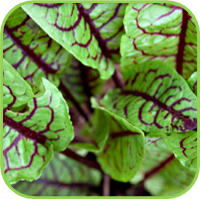 Grow your own Bloody and French Sorrel so you have fresh leaves to pick for your salad or to use when cooking. •Lance shaped mid-green leaves with a delicious sour taste. •Beautiful dark red veins with a milder taste than Sorrel. •Attractive foliage plant to add colour and interest to the gardenerennial, Evergreen, Frost tolerant. 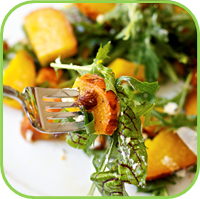 • Fresh young leaves in salads. • Cooked and eaten like spinach; In Soups, Stews, Egg dishes, Omelettes, Soft cheeses, Mayonnaise, Pancake batter. • Roast Lamb - a change from mint sauce; Fish sauces, Beef, Poultry, Pork, Tenderizing meat - wrap around meat or add pounded leafs to a marinade. • Avoid over use if you are predisposed to rheumatism, arthritis, gout, kidney stones or gastric hyperacidity due to its oxalic acid content.